Are Your Hips Strong Enough for Soccer? Since most of a player's kick speed comes from the rotation of the hips (and not from the legs) you want to make sure that your hip rotation muscles are strong. If your hip rotation muscles are strong enough for soccer, you will be able to throw them back across the room as you bring your feet together. If you have to struggle to bring your feet together, your hips are too weak for soccer. The easiest, fastest way to increase the strength and speed of your hip rotation muscles is to train with the Power Hip Trainer—the only exercise machine designed to increase the strength and speed of hip rotation for soccer players 17 and older. 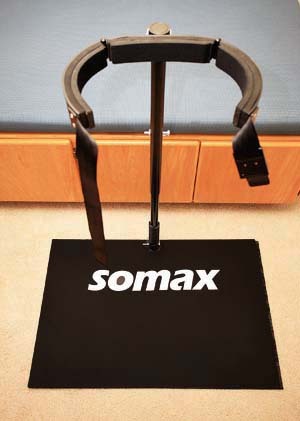 This lever system, or speed multiplier, is the ratio between the distance of your hip joints to the center of rotation, and the distance of your foot to the center of rotation. 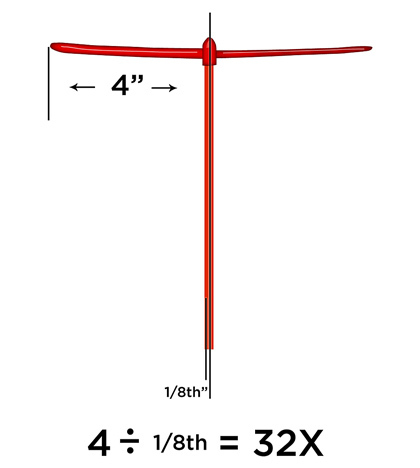 The distance of the hip joint to the center of rotation is 3 inches. The distance from your foot to the center of rotation is 30 inches. 30 ÷ 3 = 10. Any increase in hip speed will be multiplied 10 times at the foot. It is the easy, effortless way to add 10 mph to your kick speed. It's the same in soccer. There is no leverage in your legs. The leverage is all in your hips. That's why, if you want to increase your kick speed, it makes more sense to increase the strength and speed of your hips than to increase the strength of your legs. There is no leverage in your legs. Period. Are Your Hips Flexible Enough for Soccer? Next print the photo and draw vertical lines through your knees, and lines through the center of each lower leg. Measure the angles between the lines, as you see above. If you don't have a minimum of 60 degrees on each leg, your hips are too stiff for soccer. For instance, if your photo looks like this, your hips are way too stiff for soccer. 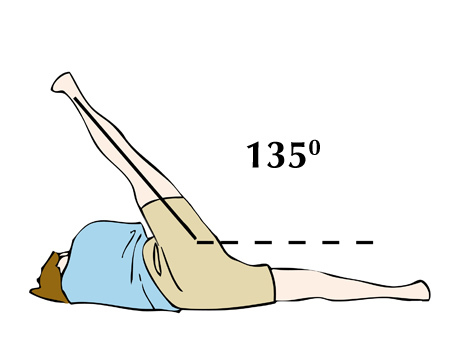 If you have less than 135 degrees of abduction on each leg, then your hips are too stiff for soccer and you will increase the stress on your legs. If your hips are too stiff for soccer, take a look at our Microfiber Reduction program—a special form of connective tissue massage that increases flexibility far beyond what stretching alone can do. Keeping your knees together, move your feet away from each other. If you have enough flexibility in your hips for soccer, you should be able to move your feet apart a total of 120°. That is 60° on each side. If you're like most soccer players, you will not be able to bring your feet together at all. If you can bring them together, it's only with a lot of effort. If you have at least 45° of internal rotation on each hip and your hips test weak—then the Power Hip Trainer is for you and will transform your soccer game as you increase your distance and control.